N.K. Electronics offers complete range of Heat Sink , Thirystor clamps for Thirystorised DC drives, Bus Bar, supports for distribution panel and complete range of Heat Sinks for UPS, INVERTER, COMMUNICATION SYSTEMS like EPBX & EXCHANGE CONTROL PANEL. We follow LM6 standard for manufacturing Aluminum Heat Sink which is as good as 92.4% pure Aluminum and must for manufacturing quality heat sink. We also manufacture Copper, Aluminum, Brass and Tin metal heat sinks. These products cool specific DC conversion components. Each heat sink offers standard options, such as attachment methods and thermal interface materials which may be used to customize the part to your specific application. The board level products are made from an extrusion, stamping, folded or bonded fin. Designed to cool component, chips, SRC, devices, diodes,thirysters and other DC conversion components used in DC drive, UPS, inverter, EPBX and other so many sectors of DC conversion systems. N.K. Electronics has experience with designs of all kind of heat sinks. As per specification for these component for there cooling specialization and for best performance. N.K. Electronics introduces itself far manufacture& designs of all kind of heavy electrical DC conversion system as constant and direct supply of high AMP. DC power in heavy electrical application like locomotive and DC motors starters. In this sectors basically thirysters DC drives online UPS's and IPS systems are taken where we use high AMP heat sinks and thirysters. We manufacture both heat sink and any type of pressure clamp for thirysterised drive as per designed and any force specifications. Along with these all heat sinks we can also supply all kinds of sheet metal heat sinks and extruded heat sink for low amperage DC conversion system. A. Complete range of Heat Sink. B. Thirystor clamps for thirystorised DC drives. C. Bus bar support for control panels. 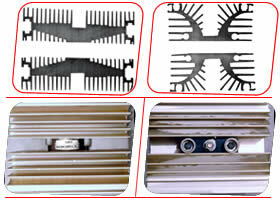 D. Designing of Heat Sink clamps as per your specification. E. Designing of thirystor clamps as per your specification. F. All size of thimbles for electrical connections. Note: We undertake orders to manufacture heat sinks as per drawings, samples or specification. 10 kn. to 20 kn. 10 kn. to 15 kn. 05 kn. to 10 kn. 02 kn. to 04 kn. All accessories used in the clamp are tensile and tampered to maintain a provided certain force. 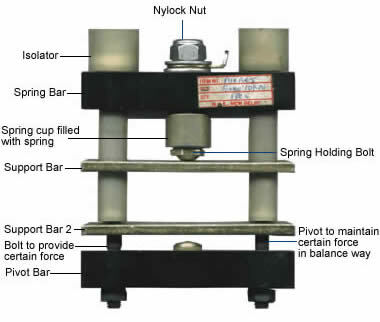 Guarantee of calibration of test is liable only when nylock nut is not disturbed. We assured that test certification standard upto 2% can fluctuate.